From starting position, lift arms to your sides and slightly below the line of your shoulders. Avoid shrugging your shoulders towards your ears, moving your head forward or arching your spine. Hold position for 5 seconds and slowly lower your arms. Repeat for three sets of 10 repetitions. Hold arms in line with your body. Do not reach over the level of your head. Relax your neck, avoid shrugging your shoulders, or arching your spine. Make sure arms are in line with your body. Relax your neck relaxed and check tendency to raise the head out front, arching your spine. Hold position for 5 seconds and bring arms down. Michael Bento is a personal trainer at the Clubs at Charles River Park, Boston, MA. Thank you for your comment. Wish you the best and will visit. First of all I’d like to say, well written post! I’ve got a small question nagging me, I really enjoy the layout of your website and tried to install the same design on my Worpdress website. Anyhow, there is some kind of weird php error in the sidebar. Do you have any hints, what settings are you using? Thank you; this is a WordPress “hosted” site. Pl check with WP support. I am so glad I stumbled upon your website looking for a recipe for saffron tea. Love your recipes. They remind me of my Indian friend’s wonderful cooking. Unfortunately, I live far from her now. I plan to go to an Indian grocery and look for jaggery and saffron. And what a bonus! 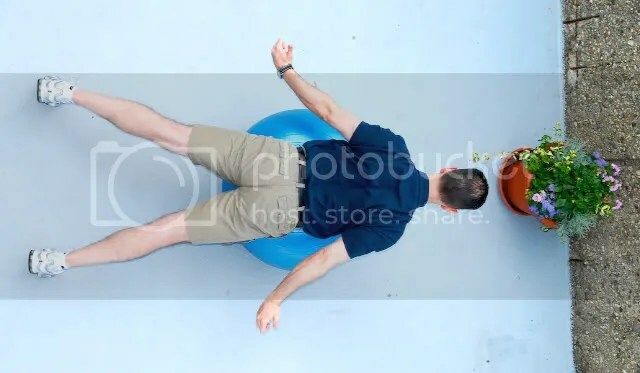 My physical therapist wants me to get a ball but did not give me instructions , so I downloaded the very complete instructions that were on the blog. Thanks for the wonderful tips. I need stretching. Best Wishes on your travels. Thank you Jeanette, for your kind words. I am thrilled that you found the details here comprehensive – I tried hard, and Mike the personal trainer featured here is awesome and work hard at developing interesting training programs. and Yes! jaggery and saffron are perfect for the winter! Best Wishes and a Happy Diwali to you! Thank you for the important tip! I agree on the importance of stretching. These are great exercises. People forget that the shoulder blade is a crucial part of the shoulder. It is amazing how many people have a weak lower trapezius. One thing I’ve found is that if people are very tight they may benefit more from stretching and getting more range, especially in external and internal rotation, before starting this exercise. Any tips for plantar fascitis? It’s flared up again and I have a 10K road race to run on Memorial Day. Ugh. Did you see this post I have on Heel Pain and Plantar fasciitis? Also, I strongly recommend this exercise, first thing when you get up and essentially any time you can sit down. And place your heel on an ice pack! and depending on how bad it is, you may be able to do your 10K! You mentioned in passing you could do these standing? Until we can find ourselves an exercise ball, could you elaborate on that? I feel a bit like a spy since I don’t know you, but I love your blog. I do have a few pics of Mike demonstrating some of these while standing. Can I send these pics to the email you used on this comment These are not the best pics and thus I was not ready to post them. 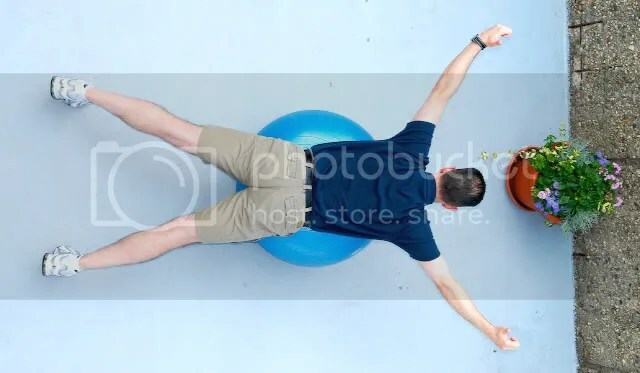 If you don’t have an Exercise Ball, first try and do this on a plain work bench (ones with no back support); Or perhaps on a stool, or the edge of a bed. I may need to shoot more pics, but I’m traveling to india and will not be able to get to it till the end of April. Wow! Now I really want to get one.So actually there`s no limit on sitting on it for work?I guess it would have to be at an apropriate height in relation to the working desk? So as not to actually put extra strain on the shoulder area..?thanx so much! when you sit on a ball, as on a chair, your thighs are expected to be parallel to the floor; so yes, it does double as a good office chair. When you get one, try and upsize a bit and keep it inflated. The air does leak out. Just be careful if you tend to move around alot while seated, like answering the phone. … and don’t throw that office chair out yet! btw, for our new lab, I have asked for a few exercise balls! Yaay! Oh this is great! Ive been wanting to get one of those balls for a quite a while now,not that I knew exactly what to do with it.. 🙂 But now I do! The shoulder area is definitely a very weak and problematic spot for all of us,even those who are not really into physical activity.The everyday stress (+ sitting long hours at our computer hmmm) just tends to build in that area and gets stuck there, blocking our energy flow,aswell as causing endless pain. bythway,I think I saw someone on a blog once saying she sat on it 15 min a day,while working on her computer.Is that possible?Maybe working all the muscles keeping steady on the ball? The exercise/medicine ball is a fabulous workout tool! This is only one of the exercises you can do. In our Gym we routinely use it for a gut-wrenching Abs workout. Hoping to do a tutorial on that at some point. 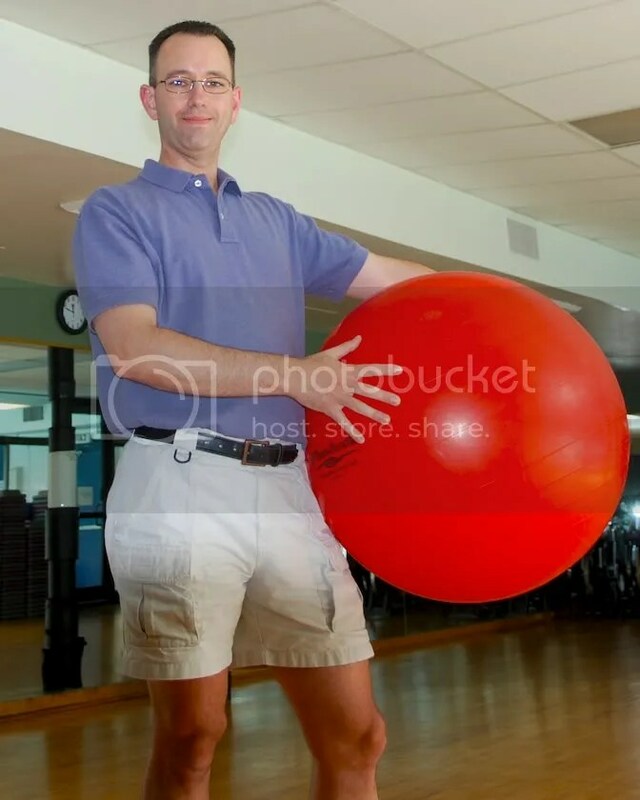 And, at the Gym, the front desk staff use the exercise balls to sit on. You cannot slouch and you need to activate your core muscle to prevent falling off. So, YES! you can use it as a chair while doing your work – and perhaps do a few crunches. Go for it! Get one! … btw, a ball comes with a instruction sheet with tons of exercises to do. And keep it well inflated! Thanks for these exercises. Strengthening core muscles and improving posture are two important goals. I have a Thera-Band 65 cm professional exercise ball. Does Mr. Bento recommend a particular size ball or will any size ball be all right? Any hints for an easy dismount from the ball for those of us who have difficulty kneeling? Hi Paula, Before I make a comment, I’m going to ask Mike Bento to see if he wants to comment. Please hold on. Generally, stability ball sizing is based on height – a 65cm ball is meant for individuals about 5’8″ to 6′ tall. However, in my experience, that’s usually more relevant to exercises done supine (on your back) on the ball. 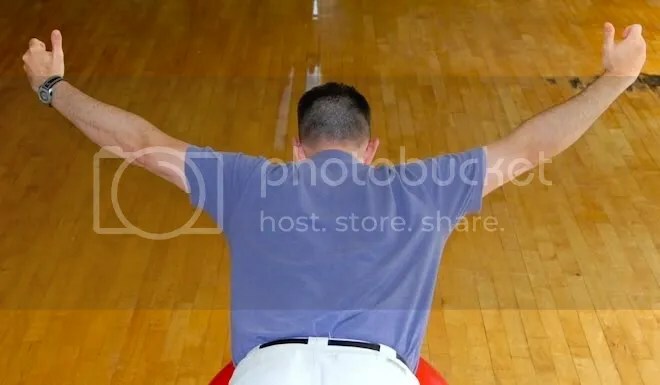 As long as it doesn’t cause you great discomfort from pressing against your abdomen or chest, your ball should be fine for the scapular control exercises in the article. 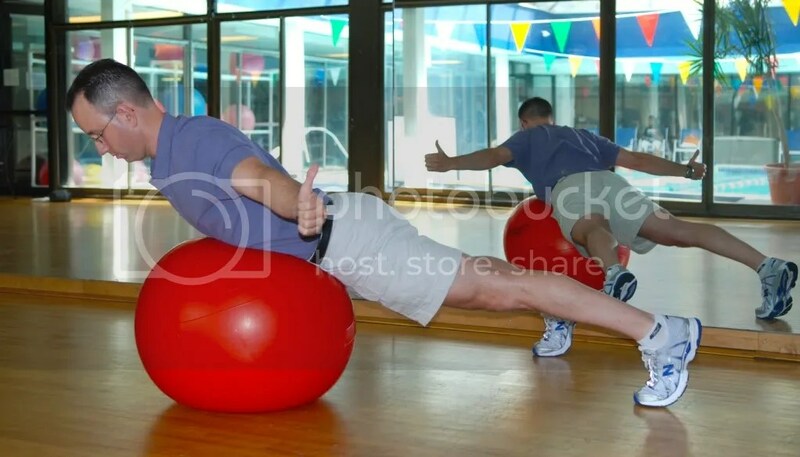 In fact, a larger ball will provide you greater stability than a smaller one. 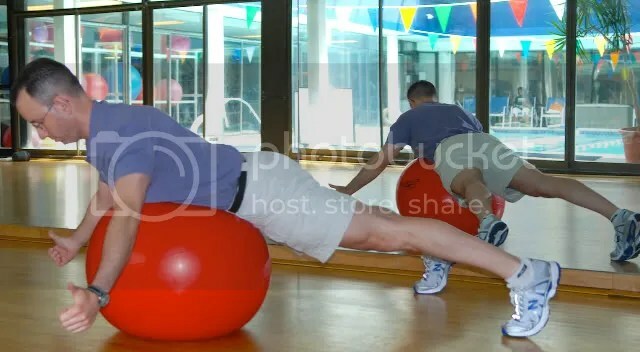 Doing any of these exercises will be difficult if you have trouble kneeling, both getting on and off the ball, but you could try placing a pillow behind the ball to cushion the joints. If it’s impossible for you to negotiate the mount / dismount without knee pain, you can substitute a standing version of these exercises with a light Theraband or exercise tubing attached in front of you. Mike thank you for sharing your thoughts. I generally use one of the foam mats in the Gym for below my knees, before getting on the ball. I guess you could also use a blanket. At home I have one of those foam boards used for swimming. They make sturdy (and relatively soft) boards to cushion the knees. Oh no. I actually feel like getting the ball out and doing these exercises! They sound simple and effective. This set of exercises nicely relaxes and scapular regions of the back. You’ll be surprised there is so much tightness there.